Are you ready for next-level productivity? Then you’re in luck. 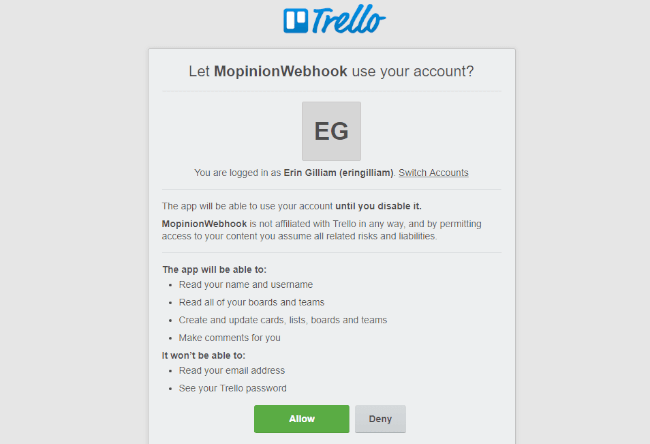 Mopinion has just launched a new integration with collaboration software Trello. This new “out-of-the-box” integration allows users to push certain feedback items to their Trello boards (and cards) without ever having to leave the Trello app! Trust us on this. We know that it can be challenging to work on several website projects simultaneously, whether those projects are for your own organisation or your customers. That is why we decided to team up with Trello and provide you with a way of bringing your feedback items to your Trello boards in real-time. You can decide which feedback results are sent to your Trello boards, using Mopinion’s webhook settings. It’s easy! The process is actually very simple. First you’ll need to login to your Mopinion Dashboard. In the menu at the top of the page, click on Settings > Webhooks. Then select the feedback form you want to use. Once you’ve chosen a form, you will be prompted to fill in your webhook conditions for that form. Start by naming your Webhook and then selecting the webhook type from the pulldown menu. Once you’ve selected the Trello as your webhook type, further set up instructions will appear below. Then you will fill in your Trello username and API key and click on Connect to Trello. Shortly after, you will be redirected to Trello’s authorisation page where you will authorise the integration. Once you allow this integration, you can start filling in which board and list you’d like to send feedback to. Then all that’s left is to ‘Generate your credentials’ and select when your data should be sent (e.g. when NPS is below 7, or all survey results, etc). In the example below, there are no question elements specified. However, you can choose to only send certain scores or items with a certain category selected (e.g. bugs), etc. Take advantage and start integrating your customer feedback with Trello boards and cards today. Mopinion is partnered with various other digital marketing applications. For a full list of integrations, visit our Integrations page.